Today was Day #4 of Chocolate and Berry Theme Week. I found these chocolates -- adorned with a Hawaiian shirt-wearing cartoon donkey -- in a Donkey Balls store in Kailua-Kona, on the Big Island of Hawaii. These, and other chocolates I purchased on the same trip, were being sold via KRM Distributors. 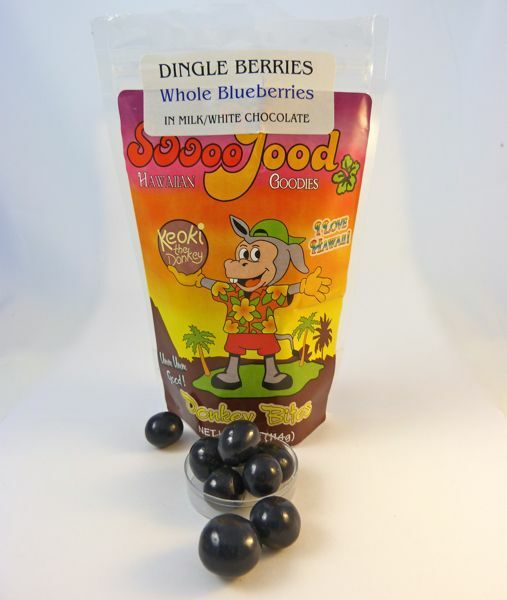 The distributor of Donkey Balls (a popular chocolate line from Hawaii), also offered Donkey Bites. 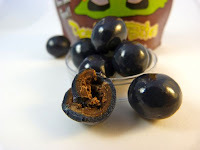 Today's featured Bites, or Dingle Berries, were blueberry flavored. Whole blueberries in milk/white chocolate, with a confectioners glaze polish. They were sweet, berry-flavored candies, with a hint of sweet milk chocolate flavor.